If you already have or are setting up a limited company to contract your services through, you will most certainly be affected by the IR35 legislation one way or another. If you have already decided that the limited company route is your best trading option, you will likely have taken it into account when making that decision. It is important to have a basic understanding of this legislation, as it will in some way effect your daily working life. IR35 is a piece of tax legislation, otherwise known as the intermediaries legislation, which was brought into effect back in 2000 in order target people misusing intermediary companies (companies through which their personal services are provided) in order to gain a tax advantage. It specifically aims at those who behave like a permanent employee of their client and would therefore, if it wasn’t for their company, be taxed as such (known as a disguised employee). The lack of clarity surrounding the legislation is often complained about as there are no black-and-white rules due to the legislation being based on previous significant cases (historic case law), which has led to a lot of uncertainty when it comes to determining whether you are caught by the legislation or not. Consequences of being caught can be financially overwhelming depending on your pay rates and years in question, so having the potential risk hanging over your head can be hugely unsettling for many. Argued throughout the community as to its relevance, this status test alone can often make or break a case. The test argues that if you are offering services as a business and not as an individual, then said business should not be restricted to the same person providing the service it has been contracted to do. It is the business in contract, not the director specifically, so if the director is explicitly required to fulfil the work, then they are not acting as a genuine business and should be considered an employee of that client. Many contractors feel that they are the expert and therefore only they can fulfil their contract, as it is themselves that they have sold to the client. Although it is acceptable for an end client to reject another worker on ‘reasonable grounds’ such as skill, experience or qualifications, it is important to differentiate between the company and director when running a limited company. The company holds the contract, so the company should be able to fulfil its contract using suitable representatives of its choice. The written contract is often the key starting point in proving this point. Most contracts will include a clause outlining the company’s right to provide a substitute, but it is important to remember that a poor clause is as good as no clause, which is why it is vital to have your written contract reviewed by an IR35 professional. Even more imperative is for your right to be a genuine one. We spoke about your working practices being the truth behind the ink, so the Revenue will want to make sure that your contract actually holds merit. Often the investigating officer will contact your end client and ask them if you are able to provide a substitute, so it is important to ensure your end client (particularly HR and somebody in an authoritative position who you deal with regularly) has a clear grasp on the terms of the contract. As a genuine business, your end client should not have control over where, when and most importantly, how you complete the contract. This test argues that if your limited company has a contract to complete specified services, often within a specified timeframe, then as long as the contract is satisfied, where it is fulfilled and when (in terms of daily hours and times as opposed to outside of the contract schedule) are irrelevant. It is generally accepted if security reasons dictate your place or time of work, or if you need to be at your client’s office within certain hours in order to liaise with client staff (although this should not be a requirement with strict hours attached) as this is necessary for the fulfilment of the contract. The test also argues that if your limited company has been contracted to complete certain services, then this is because the client cannot complete them in house, probably because they do not have the resources, knowledge or skills available. This means that your company has been contracted on the basis that you know what you’re doing, and therefore how to do it. Although a degree of client liaison and progress reporting is expected to ensure the contract is fulfilled to the client’s satisfaction and specifications, the contractor should have full control over their methods. Where an employee expects to be supplied with continuous work and an employer is expected to provide it, the relationship between a contractor and their end client should be the polar opposite. A contract is entered into for specified services to be delivered, and once this contract is completed, there should be no expectation or requirement for the end client to offer further work nor for the contractor to accept further work. In days gone by, it was argued that contracts which are regularly renewed display an employment relationship between the contractor and client, and therefore, the contractor should be classed as a disguised employee. Nowadays, however, it has been largely accepted that this is not a fair judgement, as although neither party should have any obligation to offer or accept further work, neither should have any obligation to reject it neither. On this basis, more focus has been placed on non-mutuality of obligation which refers to the ability to walk away from the contract within reasonable limits (i.e. without lengthy notice periods or unreasonable procedures). The Revenue will also look for clear start and end dates to each contract renewal to ensure that there is no presumed continuation of the relationship. When operating via a limited company, each new contract should prompt a professional review for compliance with IR35. It is not compulsory to have a review of your contract (excluding those working in the public sector who have specific requirements to be aware of), however, any penalties incurred should you eventually be caught by the legislation, are likely to be significantly reduced if you can display to HMRC that you have taken reasonable steps to ascertain your status. For this reason, we recommend always having a professional review of your contract’s compliance for IR35 prior to commencing work. Reviews are generally inexpensive, can be completed within 24 hours and widely available from accountants and IR35 specialists. Alongside your contract, you may also be able to get a professional review of your working practices. You should review your working practices regularly, even during a contract as your compliance can change throughout its term. When assessing your working practices, ensure you avoid anything which confuses your position as a contractor with that of an employee, such as having your client’s logo on your e-mail signature or receiving any benefits like access to a subsidised canteen. Remember you work for your company, which is contracted to your client. You wouldn’t expect a company to pay for another company’s staff training would you? It is also especially important to ensure real life matches your contract terms, which includes even the simplest of aspects, such as if your contract states that you must work weekdays but you don’t really have to, HMRC may well question the rest of your contract’s validity based on this seemingly small untruth. Keep a record of your contracts, contract reviews and any reviews of your working practices, even if it is just your own jottings, to ensure you have the information ready for HMRC should they ask for it. Should you receive a letter from HMRC requesting information on your IR35 status, get in touch with a tax advisor right away who can advise or even represent you, to get a far better chance of winning a case or even having it closed early on. Professional help doesn’t come cheap so you may wish to consider insurance which includes this, but we will go into more detail on insurances later on. Finally, and most importantly, simply pay the correct taxes and you will be fine. If you find that your contract is inside IR35, discuss paying a deemed salary with your accountant. It is not ideal as your take home pay may well be reduced, but at least you will be compliant and will not receive a giant tax bill a few years down the line. Should you be consistently working on contracts which are inside IR35, then perhaps consider changing your trading style as the limited company option may not be best for you. 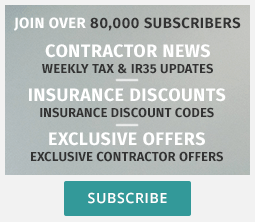 Should you wish to read more about IR35, you can find further details including the history of IR35, tests and a calculator to find out how much you could owe if caught by the legislation, in the IR35 section of our website. Will the new Small Business Minister be given any power to tackle IR35? Aliens stopped me filing my return!